Paul Gleghorne picked up a yellow card at the death just before his brother Mark fired in England's fourth goal off a PC to seal the fate of the Green Machine much to the chagrin of the large Irish contingent that had gathered at the Kalinga Stadium. 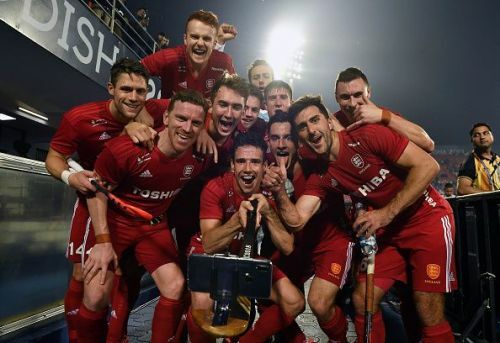 Mark refused to celebrate the goal, choosing instead of walk up to Paul's teammates and offer his commiserations to the Irish who amazed the hockey world with an enthralling show at the Odisha World Cup. For all the brotherly camaraderie that the two sides displayed after the thrilling encounter, England and Ireland refused to give each other inch on the field of play, and put to rest theories that the two neighbors might conspire to play out a goalless draw, in which case the Chinese would have had to make an early exit. The Irish who began ever so impressively, putting Australia to the test in their opener last week, might well have considered themselves worthy of a place in the knockouts - but China, the second-lowest-ranked side in the competition just about managed to advance even after being mauled 0-11 by Colin Batch's defending champions in the first match of the day. England took the lead at the end of the first quarter through David Condon but Chris Cargo restored parity for the Irish just after half-time. A flurry of three quick goals in the space of two minutes then brought the crowd to their feet and England took the lead each time Ireland equalized. For all their efforts towards the end, Alexander Cox's team failed to find a third goal and will now head home unlike the Irish girls who had made it all the way to the final of the Women's World Cup. Let us take a look at 3 factors that may have been significant in determining the ultimate course of the match which ended with a 4-2 scoreline in England's favor. England had more of the ball and did a lot more with it at the beginning of the match while the Irish lacked the hunger and the urgency to seize the initiative early. The English strikers launched a series of attacks which pegged the Irish back while Alexander Cox's side had to patiently wait for their turn to enter the England circle. While the English managed to fire in three shots on target in the first quarter and troubled the Irish's deep defence on seven occasions, the Green Machine failed to penetrate the English circle even once. England was rewarded with an opening goal in the first quarter and when Ireland look back at the match, they will indeed wonder why they failed to get moving early.